Looking for love this Valentines Day? 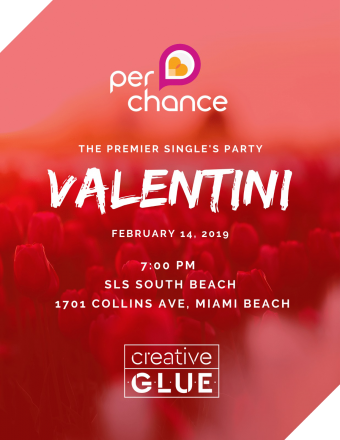 Join us for another edition of our annual singles party, VALENTINI, an exclusive evening of new encounters and cocktails at the SLS South Beach during Valentine’s Day. We are teaming up with DISC, Select, Miami Made, Getaround, and our amazing sponsors to bring back the magic of last year’s event. Over 800+ singles and couples attended all for the chance to ignite the power of LOVE & CONNECTION. This is not your typical Valentine’s event because we blend elements of interactive activities, brand activations, and our signature activation; the Perchance Speed Dating Session, which hundreds of people participated in. Expect Kissing Booths, VR activations, Tarot Readings, Pop-Ups and more. To top off the night we have a special live Art performance as well. Enjoy this and more on February 14th, 2019. PS: We fed 10k kids last year from this event and we want to feed another 15k. So come support, have a drink with us, and leave with someone special.